When not working it's not particularly amazing how much idle time you get to think whatever pops into your head. I tend to think about such things constantly until I write them down. So I'm going to write them down. Money is important. Lots of other things are as or more important, but money comes quite high on the list, partially because it takes care of things further up the list like food and shelter. Anyway, I mention this as a lead in to a discussion about salaries. I've seen two main methods of calculating salaries for full time positions, which basically boil down to internally driven and externally driven. Internal is where you figure out the value an employee brings to the company, much as you would when deciding whether or not to buy new servers. External is where you figure out the market rates for the given position and pay the new employee accordingly. What I've been thinking about of late is the concept of calculating a salary based on what a person does as an employee. Basically the idea is that you take a position and divide it up into five components, and then figure out the salary from the five components. I think it would be nice to know when you got a job that you were being paid based on some sort of rational system that applies across a whole lot of different industries rather than someone pulling a figure out of thin air. Time. Although in the full time world everyone gets hired to work the same amount of time (basically 40 hours a week) there is an implicit - and depending on the contract maybe an explicit - assumption that more hours will be worked as necessary. Figure out how many actual hours someone is expected to work a week and compensate accordingly. Responsibility. The closer somebody has to stand to the fan when it gets hit by the proverbial, the more compensation they should get for it. Simple. Aggravation. There are things in ever job that nobody wants to do, be it get up at 4am for a flight, or clean up soiled bedsheets. If possible, enumerate these tasks and compensate each one separately. Difficulty. Not everybody can do every job, and more difficult jobs should get paid more. I think it's important to separate the desired qualifications and experience from actual ability to do the job here. Excellence. Excellence is a bit of a weasel word, but it more or less covers the topic of quality and it makes for a better acronym than TRADQ (Time Responsibility Aggravation Difficulty Excellence, see?). Anyway, this is where most people get pay rises based on performance, and rightly so. It would be interesting to do some analysis using these criteria to see if there is consistency in wages across different industries. Of course that would be a lot of work, and I'm lazy. Final note: I have given more detailed thought to the criteria, but this post is already long enough. Night Angel Trilogy - Brent Weeks. Not a bad series, given I picked it up at random in an airport bookshop. Early on especially it deals with some pretty horrible topics and I don't quite think he has the writing chops to carry it off. Later on it reads more like a Raymond E Feist has played some Ninja Gaiden, or maybe God of War, which is fun. The Android's Dream - John Scalzi. For reasons both plot and atmosphere related, reminded me a lot of The Fifth Element. Scalzi writes in a way that I find it easy to imagine the film adaptations of his books, and I think Luc Besson would do them justice. Cryptonomicon - Neal Stephenson. Could have been a couple of hundred pages shorter, and focused more on prostates than I would think strictly necessary for a crypto thriller. Certainly not Snow Crash. The First Book of Lankhmar - Fritz Leiber. Worth reading for two reasons. Firstly, Fafhrd and the Gray Mouser are one of the foundations of modern fantasy. Secondly a lot of the old fantasy authors (most of which I've had recommended to me by Jonathan) are worth reading solely for the way they use the language. You will find in Leiber, Vance et al words, usages and turns of phrase that essentially could be used for no purpose besides high fantasy. I still haven't returned to Infinite Jest. I just don't know if I can handle its sheer literary density. I'm glad you made that clear because I think we all know that men deserve to die in a stampede. 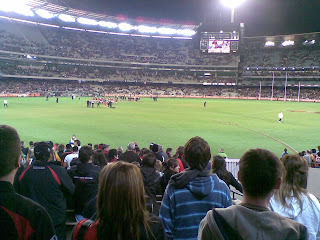 I went to the football on Saturday night for 'Dreamtime at the G' which is played as part of the AFL's indigenous round. 73,000 people at the MCG, so not quite full but certainly well attended. The Bombers winning definitely made it more enjoyable, especially coming back from a four goal defecit, but I really like the atmosphere of the football. You don't get many opportunities in day to day life to partake in an incorehent victory shout, let alone simultaneously with 40,000 other people. Also, those lights work really well, but I suggest not looking directly at them if you'd like to see anything happening on the field in the ensuing minute or so. I took the photo about five or ten minutes after the final siren (I think it was during Jason Winderlich accepting the best on ground medal, the name of which I have forgotten) so most of the Richmond supporters had already left, but the stands were substantially fuller ten minutes earlier. You may or may not have heard about a fight in an Austrian temple between a bunch of Sikhs (story here). The situation was more or less that one of the Sikhs pulled a gun during a religious argument, and in response the other men involved all pulled knives. There seems to be a slight hint in the reporting of "Those non-Christian types, they're so violent showing up to places of worship with weapons. Shame on them." True, someone did show up with a gun. People will do this from time to time. What about the knives? Well, if you know your religions, you'd be familiar with the kirpan, a knife that all baptised Sikhs are required to carry. AP mentioned that it is unclear as to whether the knives were kirpans or not, but the BBC and Reuters both say nothing about it. I'm not Media Watch or anything, but if I know about this kind of thing I'd hope world service reporters could do a little better.